Vadodara, formerly known as Baroda, is the third largest and most populated city in Gujarat, after Ahmedabad and Surat. The present population of Vadodara is 16.6 lakh and covers an area of 158.5 sqkm. Located between two major growth magnets i.e. Ahmedabad and Surat, it is an important cultural, educational and industrial centre. It is an important rail junction on the Mumbai-Delhi and Mumbai-Ahmedabad corridors and lies on the golden corridor from Ahmedabad to Vapi. This favoured Vadodara to be one of India?s foremost industrial centres with dominant industries of chemicals and pharmaceuticals, and machine tools. Major industries like the GSFC and IPCL are located on the outskirts and are the major employment centres. The city is faced with increased migration population due to economic base, presence of commercial pockets, educational facilities and industrial potential. The Population growth rate for the last decade was 14.16, with a projected population estimate of 22 lakh by 2021. While the city is experiencing moderate growth and holds high potential for development, a strategic planning approach is imperative for advancements in a sustainable manner. Characterised by organic street pattern, mixed land use and high density built forms, the City has short trip lengths and good share of Non Motorised Traffic. With the increase in population, the city is growing in size, with resultant increase in trip lengths and travel demand. Though not significantly faced with issues of congestion, pollution and traffic grid lock of the present day, there is a remarkable(8.5% growth rate) increase in private motorisation, specially exhibiting an alarming percentage share of two-wheelers (76% of total registered vehicles). This gradual shift to private vehicles is of growing concern and sustainable solutions are sought as part of a long term visioning for the city development. Since 2008, the mobility need of the city is addressed by a private city bus operator. These buses ply only on limited routes, catering to a low percentage (4% – about 1 lakh passengers per day) of the total motorized trips. This has added to the concern and need to prepare a transit and traffic improvement plan for enhancing mobility in the city. As a step, shifting to greener modes of travel like public transport, walking, bicycling etc is being promoted in the transport sector and related infrastructure developments. Vadodara Mahanagar Seva Sadan (VMSS) is considering introduction of Mass Transit system and other complimentary measures to improve mobility in the City. The City faces lack of street space, resulting in conflicts between people, goods and vehicles, accentuated by the recent high motorization rate. Given the present space limitations of roads in the city and its usage, allocation and reservation of road space for public transit is a necessity of the day. Hence there exist a need for lane demarcation and lane segregation. 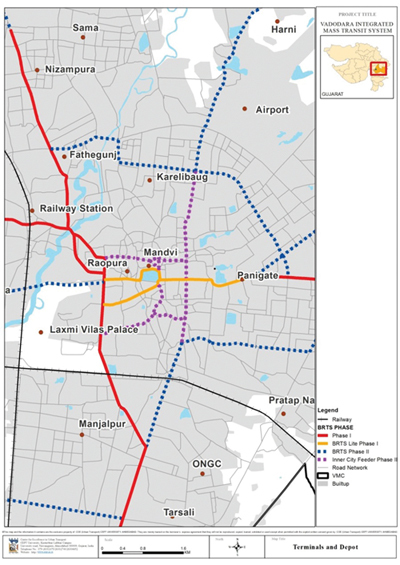 A Bus Rapid Transit (BRT) system is proposed for the City which ensures segregated lanes for buses, pedestrians, bicyclists and other motorised vehicles. A detailed project report for BRT system has been prepared by the Centre of Excellence in Urban Transport (CoE-UT), CEPT University. DPR has been submitted to the Ministry of Urban Development, Government of India for funding under JnNURM.
? To ?connect busy places and avoid busy roads?, the network connects areas like railway station, M.S. University campus, Makarpura industrial area along with popular tourist destinations. Based on ease of implementation and existing ridership on the city bus service, a tentative phasing plan is shown below. 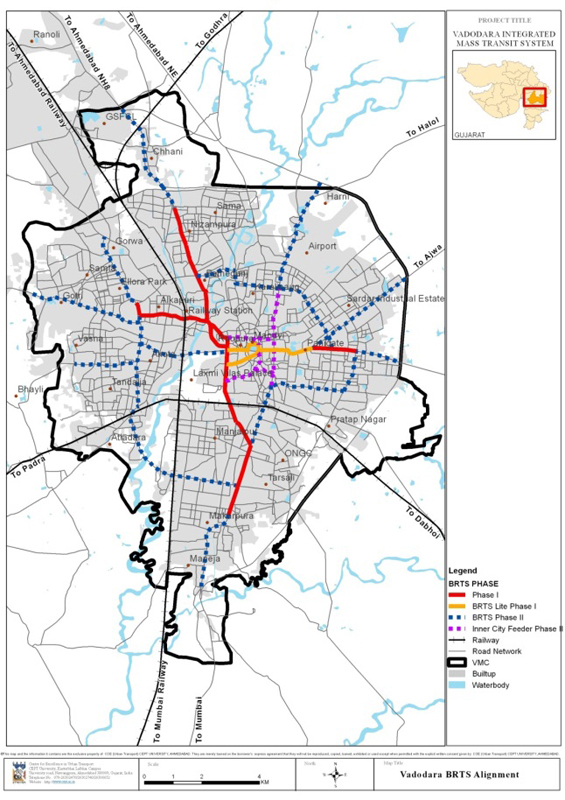 A network of 22 km is proposed in phase 1, which includes a north south connection from Fatehgunj to the industrial estate of Makarpura in the south and an east west connection from Akota to Waghodia road. Phase 2 would be implemented on the ring road, and would include dense residential areas, airport and upcoming commercial areas. It would also provide impetus for undeveloped areas to develop.